The Centre for Chinese Contemporary Art (CFCCA) is possibly one of the most interesting art galleries I have ever been to. The art gallery itself does not have hundreds of pieces of art, nor does it have a huge amount of space to work with, yet what you see is still so fascinating. CFCCA’s current season that will run between January – June 2017, focuses on the work of artists using lens-based media with a mixture of old and new technologies. The current exhibition is entirely the work of Hong Kong born artist, Suki Chan, whose past work has used light, moving image and sound to explore our physical and psychological experience of time and space. The exhibition which is called Lucida and Lucida II, is taken from the word lucid which is defined as clear and easy to understand. This simple yet complex exhibition sets out exploring the relationship between the human eye, the brain and vision. Gallery 1 (Lucida) is not for those who aren’t a fan of the dark as we start this visual experience in a pitch black room. As you enter your eyes are forced to adjust to the dark and you are presented with three different screens, a chair and an eye-tracking sensor. The idea behind this piece is as follows. In the dark room you sit in a chair that has been placed in front of a sensor that tracks the movement of your eyes. In front of the sensor is the first screen that plays a short, point of view video that follows a person walking through an old library and boiler rooms. Screens two and three, which are placed slightly to the right, respond accordingly to your rapid eye movements. Screen two will simulate the information received by the eyes and screen three will simulate the information that our brain receives. From my understanding ,this piece of visual art tried to show the difference between what information that the eye received and the illusion that our eye actually creates. This concept is something you might expect to see in a science museum but has been taken by Suki Chan and made into a form of art work. 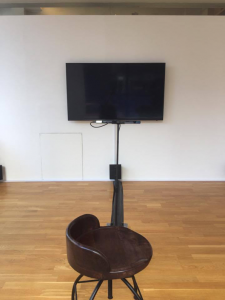 In Gallery 2 (Lucida II), we see a similar piece of work following the same idea with an eye-tracking sensor. In this piece of art much like the other, your eyes are tracked by the sensor which is displayed on the screen in front. At first, the image on the screen looks like a blurry night sky but once your eyes have collaborated with the sensor the image becomes clear and full of colour. To create these pieces, Suki Chan worked with neurobiologists, psychologists and vision scientists to help her gather a better understanding of how the eyes and brain worked together to create images. When I first went to CFCCA, I was expecting a journey through historical Chinese art work that would lead me through to a more modern style Chinese art. Instead I was taken on a visual journey that toyed with the movement of my eyes and created an experience that has truly made me think about how our eye perceive images. CFCCA, is a very interesting place that not only displays artists work but also offers free accommodation for the artists that are working on one of their exhibitions. I very much enjoyed this simplistic yet thought provoking work from Suki Chan and strongly advise that it is work a visit.